Air NewZeland Give Bare Safety Essentails! Air New Zealand has hit on a novel way to make sure people pay attention at in flight briefing time. The national carrier's safety video for domestic services on its Boeing Co 737 planes show pilot and cabin crew dressed only in body paint. But the safety message is kept seemly by carefully chosen camera angles. A copy of the briefing has been posted on the popular Internet site, YouTube. http://www.youtube.com/watch?v=7-Mq9HAE62Y . 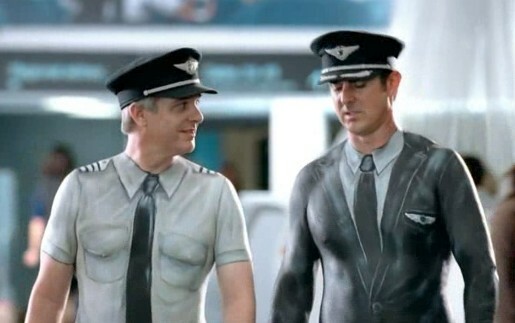 The safety video follows the same tactic as the airline's recent marketing campaign for its low-priced fares, which featured staff, including chief executive Rob Fyfe, adorned in only body paint. VeryHappyPig says lucky they didn’t paint a naked Mrs VeryHappyPig and put her in the video. If they did it would have the opposite effect and force people to avert their gaze.